The BJP has found itself in a soup after a video of a speech by none other than the party's president in Kerala, P.S. 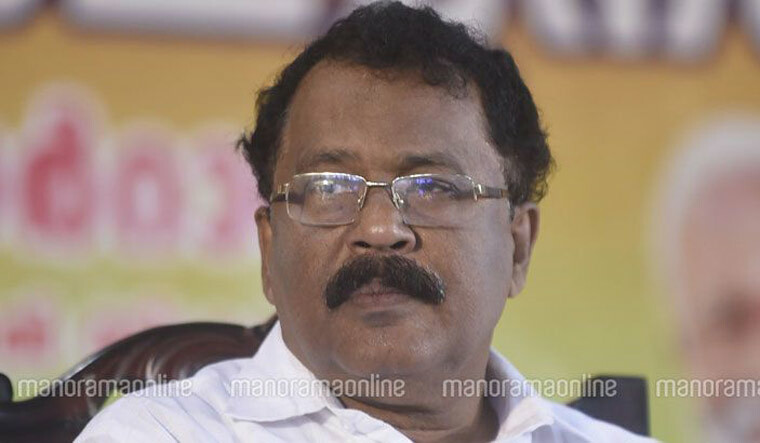 Sreedharan Pillai, over the Sabarimala issue went viral on Monday. In the video, Sreedharan Pillai can be heard boasting that the ruckus created by Ayyappa devotees at Sabarimala against the Supreme Court order was a BJP agenda. "The stand-off at Sabarimala between September 17 and 22 was planned and executed by the BJP," he says, addressing BJP workers at a Yuva Morcha meeting in Kerala's Kozhikode district. "Sabarimala is a puzzle. We cannot expect it to move along a fixed line. It is not in our hands. But we have put forward an agenda, and others are gradually falling for it. It is a golden chance. In the end, it looks like only we (BJP) and the ruling party (Left Front) will be the last people standing," he says in the leaked video. "As directed, our (party) general secretaries successfully staged protests at Sabarimala. Similarly, when (IG) S. Sreejith escorted two women devotees to the shrine, it was a group of Ayyappa believers led by a district general secretary of the Yuva Morcha who prevented and blocked them from entering the temple. But then later, with stringent security checks, the issue took off to a different level," Sreedharan Pillai can be heard saying. The revelations are likely to put the BJP on the defensive. Following the Sabarimala stand-off, Kerala Chief Minister Pinarayi Vijayan had, on numerous occassions, blamed the RSS, the BJP's parent organisation, for unleashing violence at the hill shrine. Commenting on Pillai's video, Kerala CPI(M) Secretary Kodiyeri Balakrishan said the clip is very serious and appalling. "The hideous conspiracy intended at subverting the Constitution got exposed through the leak. Concrete actions must be taken against this," he said. In the video, Sreedharan Pillai adds that Sabarimala priest Kantararu Rajeevaru had consulted him before threatening to close down the temple in case women in the menstrual age entered the temple. "He (priest) called to ask if he would be booked under contempt of court if he closed down the temple. I replied: 'Before you, the BJP president of Kerala and thousands of party workers will be booked for contempt of court. You are not alone in this fight.' And the tantri went ahead. This shows that the priests now have more faith in the BJP and its president," Pillai says. A contempt of court petition was later filed against Kantararu Rajeevaru for threatening to shut down the Lord Ayyappa shrine. However, the BJP president warned against bloodshed in fighting the Sabarimala case. "We should not focus on an immediate result. We should continue to strongly resist entry of women. But then it should not be a war. Personally, I feel Sabarimala issue should not be fought by spilling blood. But it should be a long-standing fight," he says.